I suspect most beginning fly tiers kind of slide into tying based on need. Initial efforts are often limited to whatever fly or flies the tier intends to use on his or her next fishing trip, and early efforts are usually restricted to the least complicated flies. (No size 28 parachutes!) At least, that’s the way it happened with me. A group of us -- more years ago than I want to remember -- began what was to become an annual pilgrimage to Maine in late May to fish the Penobscot river for brook trout and landlocked salmon. The hot fly back then—and it’s still pretty hot--was the Grey Ghost streamer; because it imitated a smelt and smelt serve as the main course for landlocks right after ice out. Brook trout also find them quite tasty. Anyway, you can see where the loss of a number of flies, at what I remember to be a buck a piece, would be statistically significant and could put any of us in financial distress. So, we all began tying flies. Tying the Ghost didn't take much finesse, but it did take quite a bit of time, because of all the different materials in the fly. Eventually we got pretty good at tying Ghosts and began tying our own variations. Flash-a-bou showed up in the wing. The peacock herl moved from under the hook to the top of the wing, because someone said "Fish are darker on top than they are on the bottom." The more daring among us even began varying body color and the shape of the ribbing. All of a sudden, we had become artists and creators. However, we still only tied enough Ghosts for the Maine trip. Then, one year, weather changed the course of history. It warmed up early; so, the ice went out early, and the primary smelt run was over by the time we hit Maine in late May. Oh, the fish were still eating Grey Ghosts -- because they had good memories -- but they were also feeding on something else, too -- flies on top of the water. What kind of flies? Well, at that time none us were entomologists, so we just called them "big goddamned yellow-bodied flies." We knew right away -- so did the fish -- that these flies didn't look like Grey Ghosts. During postmortem meetings, after we returned home, we poured over fly tying books to find out what those big goddamned yellow-bodied flies were. Finally we hit on it. They looked just like a size 10 Grizzly Wulff. They were big goddamned yellow-bodied Wulffs, and that's what we call them, even today -- big goddamned yellow-bodied Wulffs. We still don't know the proper entomological name, but "big goddamned yellow-bodied Wulff" works fine. So, through a whim of nature, I was placed in a position where I had to tie two different flies for the Maine trip: the Grey Ghost and the big goddamned yellow-bodied Wulff. Now, whereas the Ghost didn't call for much finesse or expertise, the big goddamned yellow-bodied Wulff did. The pattern not only specified upright wings, but it called for hair wings; plus Wulff flies need hackle -- big bushy hackle -- so they can float. Making something float, now that calls for big-time finesse. That's something, according to my wife, that God didn't give me. If something calls for finesse, I hit it with a left, instead of a straight right; so you know that my early tries at tying the big goddamned yellow-bodied Wulff were amusing. I didn't have a lot of trouble with the tail or body, but the hair wings and the hackle gave me fits. Keeping the hair on top of the hook when I tightened the thread presented me with one problem, then getting the wings to stand upright was another. 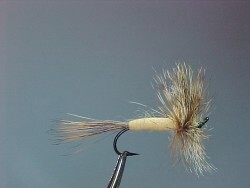 Tying in the hackle was a new experience, and my size relationships between the body, tail and wing were interesting. 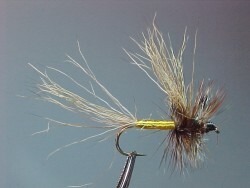 The wings on my size 10 Wulffs would have been just fine on a size 4 dry. But, by Maine time the following year, the old standby supply of Ghosts, was accompanied by a handful of big goddamned yellow-bodied Wulffs. I was not particularly proud of them, and none of my buddies asked me to "tie a few for me." But I had them. The major portion of that year's trip demonstrated that great fly fishing axiom. The quickest way to eliminate a hatch is to tie a number of flies that match it. No big goddamned yellow-bodied flies came off. Then, on our final day, as we were driving away from our campsite and crossing the bridge at Matagamon, the fish God smiled on us. Actually, he laughed like hell. Suddenly, the air was filled with flies, big goddamned yellow-bodied flies, and the water boiled with rises. You could close your eyes and cast to a feeding fish. All four doors on the Suburban were thrown open, and waders, boots, rods, reels and vests flew out. Two hours of packing came undone in two minutes. Five of us hit the river at the same time. I took out my box of big goddamned yellow-bodied Wulffs and tied one on. My hands were shaking so much I had trouble getting the tag end of the tippet through the second loop in the double clinch knot. Finally, the fly was on. I got about forty feet of line in the air in record time and laid the big Wulff on the water about ten feet above a feeding fish. Just then, a voice from the bridge above me shouted: "What the hell kind of fly is that?" One of the locals had been attracted by all the activity. "It's a Grizzly Wulff," I answered. With that, he replied: "Goddamned thing looks like a sea gull. It'll show up on radar." Just about that time, the trout swallowed the fly, and I said: "Then this must be a sea gull hatch." The fish turned out to be a fifteen-inch brookie. Now, the flies I tie today sure look a lot better than those big goddamned yellow-bodied Wulffs, and some of them are a hell of a lot smaller; but they don't work any better than the sea gull did that day. The moral of the story is that flies don't have to look good to people, only to fish; and while some fish are very, very selective, others -- especially brook trout -- are gastronomic hogs. "Big God-Damned Yellow-Bodied Wulff" - THEN (as featured in the story below!) and NOW.